Today is the winter solstice, which also makes it the fifth anniversary of this blog. I tend to like to post about archaeoastronomy on these occasions, and as I mentioned in the previous post I’m currently in Albuquerque and have been reading up on the archaeology of the Rio Grande Valley. Luckily, a recent article I read has a very interesting archaeoastronomical proposal specific to this region, which makes everything come together nicely. Getting to that point requires some explanation of the context first, however. Today the northern Rio Grande Valley is one of the main centers of Pueblo population, and this was also true at the time the Spanish arrived in the sixteenth century. It’s been clear to archaeologists since the late nineteenth century that the modern eastern or Rio Grande Pueblos belong to the same overall cultural tradition as both the modern western Pueblos (Laguna, Acoma, Zuni, and Hopi) and the prehistoric Pueblo sites found all over the northern Southwest. Within this overall cultural tradition, however, there are noticeable differences in certain aspects of culture between the Rio Grande Pueblos and those further west, as well as between both groups and the prehistoric sites. The long and complicated history of interaction between the Rio Grande Pueblos and the Spanish has both led to cultural changes in this region and made the modern Pueblo residents very reluctant to reveal information about their cultures to anthropologists. Both of these phenomena make understanding the background of Pueblo diversity exceptionally difficult. As a result, archaeological research in the northern Rio Grande area has proceeded along a somewhat different course from research further west. While extensive early research at well-preserved abandoned sites at places like Chaco Canyon and Mesa Verde led to the formulation of a robust and well-supported relative chronological scheme by the late 1920s that was soon anchored by the absolute dates provided by tree-ring dating, fitting the Rio Grande sites into this sequence proved to be a challenge. Alfred Vincent Kidder’s extensive excavations at Pecos provided clear evidence of continuity between prehistoric and historic Pueblo culture, which allowed the historic Pueblos to be easily placed at the end of the sequence, aligning earlier developments in the east and west proved to be a challenge. Pecos itself was founded quite late in prehistory, and very few other prehistoric sites had been excavated in the Rio Grande area. The so-called “Pecos System” of chronology and culture history was actually based primarily on western sites, and over time it became clear that it didn’t fit the emerging picture of Rio Grande prehistory pretty well. That picture, based primarily on survey and excavation work done by the Laboratory of Anthropology at the Museum of New Mexico starting in the 1930s, by the 1950s resulted in a new framework for eastern Pueblo prehistory. The most obvious difference between the two systems is that the Pecos System contains more periods. A more subtle difference is that in the Pecos System all of the periods are associated with agriculture, which appeared quite early in the Four Corners area. Exactly how early was not quite clear in 1954; Wheat says it was “about the time of Christ.” In the Rio Grande, on the other hand, the Developmental was the earliest agricultural period in Wendorf’s scheme as well as the first ceramic one, preceded by a Preceramic period that was totally undated at the time but that Wendorf suggested may have lasted quite late, even after the beginning of the Developmental. This pattern of delayed appearance of typical “Anasazi” cultural phenomena in the Rio Grande persisted throughout Wendorf’s scheme. He defined the beginning of the Coalition period by the switch from mineral to organic pigment in pottery decoration, a trend which had been gradually diffusing east from Arizona over the past few hundred years. Similarly, the beginning of the Classic was defined by the appearance of glaze-decorated ceramics, which had appeared a few decades earlier in the Zuni area. The Historic period began with the onset of Spanish colonization. In general Wendorf’s period definitions depended heavily on trends in pottery decoration, in contrast to the Pecos periods which were defined by a broad suite of material culture changes, with architecture especially important. One reason for this was that architecture and other cultural traits were bewilderingly diverse within each of these periods, especially the Developmental, and this diversity was apparent even with the very small number of excavated sites at that time. 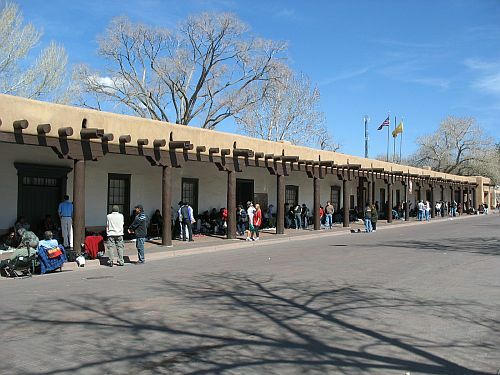 Wendorf’s scheme was in conflict on various points with a different scheme for Pueblo culture history as a whole developed by Erik Reed of the National Park Service. After Wendorf’s paper was published, discussions between the two led to an updated version of it published under both their names the next year in El Palacio. This paper has been extremely influential and the framework it established has been used by most archaeologists in the Rio Grande area since. The basic outlines of the framework are the same as those in Wendorf’s 1954 paper, with the changes involving the correction of the numerous typos in that paper, the addition of data from more recent excavations, and a somewhat different discussion of attempts to correlate archaeological phenomena with the complex distribution of modern linguistic groups. The latter was a particular interest of Reed, whose theories on it had been criticized by Wendorf in the earlier paper. I find it interesting as well, but I won’t get into it here. Instead my focus here is on Wendorf and Reed’s Developmental period. Wendorf originally defined this period based on extremely limited information as a time of low population, diverse architectural styles and settlement patterns, and evidence of cultural influence from the San Juan Anasazi to the west. Population was extremely limited until about AD 900, when many more sites appear to have been inhabited and sites began to appear in the northern part of the region for the first time. This is the time of the rise of Chaco, and local Rio Grande ceramics show clear similarities to Chacoan types. Some archaeologists, including Reed, had argued that this rise in population came from an actual immigration of people from the Chaco area, but Wendorf doubted this, pointing out that other cultural traits showed considerable differences from Chacoan patterns. He suggested that while there could well have been some immigration from the west at this time, it was more likely from somewhere like the Mt. Taylor area that was part of the general Chacoan sphere of influence but closer to the Rio Grande, and that the number of people was likely small. Architecture during the Developmental period was varied, with site sizes ranging from ten to 100 rooms and one to four kivas. The kivas were round and lacked most of the typical Chaco/San Juan features such as benches, pilasters, and wall recesses. They also usually faced east, in strong contrast to Chaco kivas, which usually faced south or southeast, even when they were associated with east-facing surface roomblocks (a common pattern for small houses at Chaco). 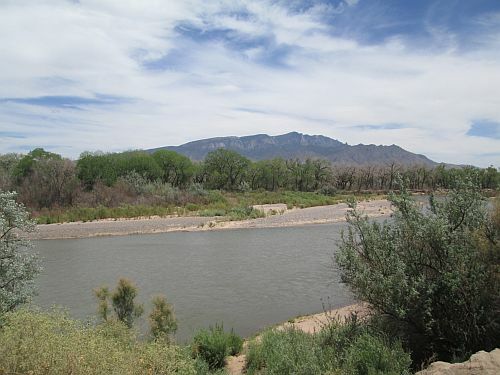 While the Wendorf and Reed system has remained in general use among Rio Grande archaeologists, the Developmental period in particular has seen much more data emerge from subsequent research, much of it associated with cultural resource management salvage projects. 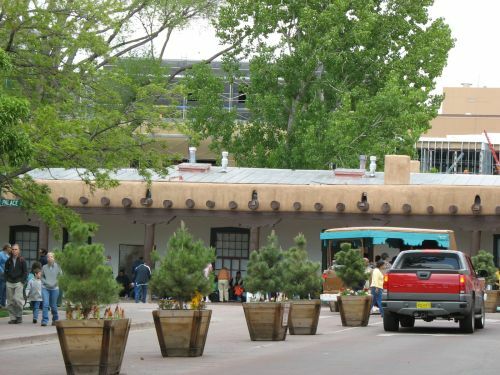 Cherie Scheick argued in a 2007 article that the period was much more diverse and complex than Wendorf and Reed had portrayed it as, illustrated by two nearby and contemporaneous sites in what is now Santa Fe that nevertheless had quite different ceramic assemblages which would place on in the Developmental period and the other in the Coalition period based on the Wendorf and Reed system. (This sort of thing is a major flaw with chronologies based mainly on ceramic styles, since time is by no means the only factor affecting differences in pottery.) Basically there seems to have been a long transitional period between the Developmental and Coalition in which communities with a variety of ceramic styles existed in close proximity. In particular, the introduction of carbon pigments seems to have been more variable than Wendorf and Reed realized, and they coexisted with mineral pigments for a substantial period. Scheick also points out that, contrary to what some earlier researchers had thought, there are no particular patterns over time in the architecture, such as larger villages developing later in the Developmental period. Lurking in the background of all this research is the question of the abandonment of the Mesa Verde region and whether any of the apparent increases in population in the Rio Grande correspond to an influx of people from that area. Wendorf and Reed placed this migration in the middle of their Coalition period, with the appearance of a ceramic type, Galisteo Black-on-white, that is very similar to late Mesa Verde Black-on-white, and various other changes in material culture in the region that accompanied a population increase. However, recent research in the Mesa Verde region itself has suggested that the depopulation was a longer-term process beginning much earlier than previously thought, so some of the changes in the early Coalition period, could also be due to immigration. The basic problem is that while there are plenty of individual examples of similarity between San Juan/Mesa Verde culture and Rio Grande culture over a long period of time, there are no sites showing a complete package of San Juan cultural traits. There seems to be an emerging consensus that this is because the migration was primarily not of entire communities moving as units but of smaller units (families or lineages) that joined existing communities in the target region, perhaps ones that they had had earlier contact with through trade or other activities. An additional piece of evidence for this idea comes from the paper I mentioned at the beginning of this post, published by Steven Lakatos in 2007. Lakatos did an analysis of features in Rio Grande pit structures (kivas) during the Developmental period. He looked at size, orientation, and presence or absence of a hearth, an ash pit, a deflector, and a ventilator in a total of 131 excavated pit structures in the Rio Grande Valley dating to AD 600 to 1200. He looked at specific types of each of these features and came up with a wide variety of statistical comparisons. The sample sizes for most of the subsamples he looked at are so small, however, that I doubt many of these comparisons are meaningful. His overall conclusions, however, are probably reliable. Lakatos found that there is a consistent pattern of features in pit structures throughout the Developmental period: hearth, ash pit, deflector, and ventilator, sometimes accompanied by sipapu and/or ash grinding stone, in a row aligned to the east-southeast (average azimuth from true north of 118 degrees for the Early Developmental period and 123 degrees for the late developmental). This is in strong contrast to the San Juan (Chaco/Mesa Verde) kiva pattern, where ash pits are rare, other features like benches and pilasters are common, and orientation is usually to the south or south-southeast. Lakatos notes that this Rio Grande kiva pattern continues into the Coalition period and later, as kivas become more formalized community-scale integrative structures, and while all the features in the complex potentially had originally mundane uses, the formalization of the pattern and its persistence over time suggest that at some point it acquired ritual significance. 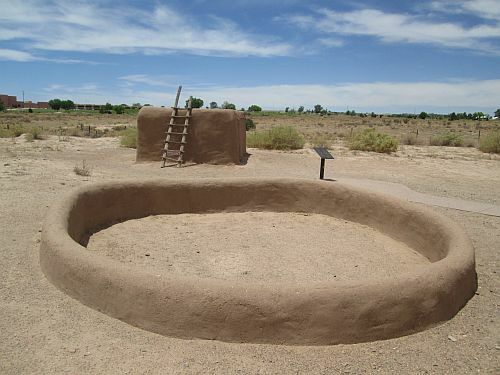 He notes the ritual importance of ash to modern Rio Grande Pueblos as a way of explaining the ash pit and ash-grinding stone as ritual features. The persistence of the pattern into the Coalition period and beyond suggests to Lakatos that immigrants to the Rio Grande from Mesa Verde and elsewhere not only joined existing communities, but largely assimilated to existing religious and cultural practices in an area that had developed a distinctive identity already. Thus, the reason it is so hard to pinpoint continuity between San Juan and Rio Grande archaeological sites is that the San Juan immigrants changed their culture to conform to Rio Grande practices. I’m not sure I buy that there was quite as much continuity in the Rio Grande as Lakatos and other Rio Grande archaeologists tend to think. Looking at it from the outside, the ceramic evidence certainly seems to imply at least some continuity with Mesa Verde culture, and a close examination of what little ethnographic information is available on the Rio Grande Pueblos may reveal other traits of western or northern origin. Still, Lakatos’s evidence for continuity in kiva form looks convincing to me, and the patterns he identifies are certainly quite different from those of Chaco and Mesa Verde. The fact that his interpretation meshes well with other research suggesting migration by small groups into established communities is also encouraging. So what does all this have to do with the winter solstice? Well, Lakatos also calculated the azimuth of winter solstice sunrise for the Albuquerque area in AD 1000, and it was 119 degrees east of north. This is strikingly similar to the average azimuths of the kiva alignments he analyzed, which have small standard deviations indicating strong clustering around the average values. The variation that does exist could easily correspond to local horizon variation in this rugged, mountainous region. Lakatos expresses surprise at this finding, but it makes perfect sense to me. The winter solstice is an enormously important event for the modern Pueblos, as Lakatos discusses, and pointing their kivas toward it would be a natural response to that importance. And with that in mind, I wish all my readers a happy solstice. I’m currently in Albuquerque visiting my mom, and while I’m here I figured I read up on the archaeology of the Rio Grande Valley and do some posts on it. I’ve read some interesting articles from the journals I have access to, and I’ll have some substantive posts soon based on that, but one thing that has limited me so far is that so much of the early archaeological literature on this region was published in El Palacio, the magazine of the Museum of New Mexico (named after the Palace of the Governors, the original location of the museum). Today this is basically a glossy (but serious and substantive) magazine aimed at a popular audience, but in its first few decades it functioned more like a scholarly journal and was the primary venue for publication of research on the archaeology, anthropology, and history of northern New Mexico. The problem with this for someone like me had been that, unlike other major publication venues for this kind of research that have evolved into (or been created as) peer-reviewed scholarly journals, El Palacio is not included in any of the major academic databases, and it could only be found on paper in libraries that happened to subscribe to it. This made it effectively impossible for me to access it, given geographic and time constraints, so I was at a distinct disadvantage in understanding the archaeology of this region. That’s all changed, however. I discovered today that, apparently as part of the commemoration of the magazine’s centennial this year, El Palacio has put its entire archive online. The interface is a little clunky, and it looks like it’s only possible to download pdfs of entire issues rather than individual articles, but this is still a fantastic resource that has suddenly become vastly more accessible. Given my general interest in open access publishing and making data broadly available, I figured it was worth doing a post to point this out. I’ll have some more posts on the actual archaeology of the northern Rio Grande soon.